Cherry flavored Nutri-Lytes Electrolytes is a well balanced, high quality supplement capable of restoring and replenishing cellular body fluids and minerals lost during stressful performances. It is a water soluble source of electrolytes for use in feed and drinking water. 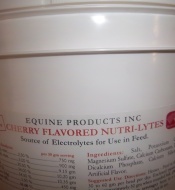 Our Nutri-Lytes Electrolytes formulation contains potassium, sodium chlorides, calcium carbonate, magnesium sulfate, dextrose and cherry flavoring in the appropriate levels restoring your horse's energy levels. 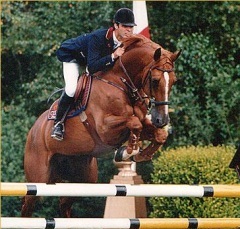 Feed at the rate of one (1) to two (2) ounces per horse per day. Enclosed measuring cup holds one (1) ounce. Store in a cool, dry place, and keep tightly closed when not in use. For animals only; keep out of reach of children. Potassium, Sodium Chloride, Dextrose, Calcium Carbonate, Magnesium Sulfate, Artificial Flavor and Artificial Color.